We've lived here at Two Bears Farm for twelve years, and during that time have never logged the place. We have 72 acres total, the majority of which is wooded. The woods haven't been logged since the 1970s, as far as we know. Mostly, I was opposed to logging because of the thriving wildlife. I think of the birds and squirrels who live in the trees. Who find their meals there. Who may have been living in knotholes and nests for many generations. You're probably thinking I'm a sap by now, but those animals have every right to their trees. Not to mention other negatives - like the spreading of kudzu (of which we already have too much) and the erosion of land. What can I say? I'm an environmentalist at heart. Oh, I know that logging has it's good points. Overly dense forests are prone to wildfires and all that (case in point - our neighbors set fire to their property a few months ago - I think their teens were probably smoking but they offered the firemen some wacky not-so-believable excuse). And we are not clearcutting our land - rather thinning the older trees, which will allow for new growth. Still. When I heard that first big old tree crash to the ground, my heart shuddered. Sadness filled my lungs and made it hard to breathe, just for a moment. Nevertheless, we need the money right now, so it is what it is. To assuage the guilt, I have taken on a few projects around the house to give back to the earth. I finally started a recycling center, which is a semi-big deal since we don't have anywhere to recycle in our county, and will have to transport these items to a recycling place in the city. I also invested in a reusable paper towel set, a drying rack, and dryer balls (which make the clothes dryer, when you do use it, more efficient). These things are in addition to the small efforts we make daily already like cloth diapers and composting. I know it's not much. Not enough, really. But it's something. And hopefully these woods of ours....well hopefully they won't be logged again for at least another 40 years. This post will be linked up tomorrow with Pour Your Heart Out at Things I Can't Say. I am guest posting over at My Mad World today. Please go visit and say hi - there's an easy kid's craft and a very funny picture of Pierce too! Recycling center at the bottom of our hill. I can drop off your stuff on my way home if you like. Cardboard boxes have to be broken down flat. I also have an extra bin for cans/bottles if you need it. And I can give you some cloth napkins. I use them like paper towels when I run out of dishtowels. Just let me know what you want. I am so sorry to hear about you having to harvest your trees. I don't suppose there are any conservationest who would consider replanting for you. I am aware that it takes 15 yrs for a pine tree to reach maturity. Maturity is when the trees are able to support wildlife of all kinds. Hard wood trees are a different story. Sadly the hardwood forest almost never recover in several lifetimes. I can only imagine your sadness. You have no choice. Many Blessings to you and, and may the almighty cast the seeds of Hope. I can understand your feelings about the logging! Guess we're just "softies" about those animals. I can understand feeling that way. I am quite the nature lover myself. Never heard of dryer balls? Our next step is cloth napkins. I bet it was hard to see the trees go, but you do a lot already to help the Earth. I bet some of them were ready to go. I bet it was hard to see the trees go but we all have to do what works best for us. One thing about it is you can always plant more trees! If you get a chance I would love for you to enter my eco friendly giveaway. I can understand feeling awful..there's a big, gorgeous Aspen that has to come down and I feel terrible about it. Sometimes, it has to be done. I would be a happy gal if we were getting paid for it, instead of paying to have it done. Money matters! I know it is hard to see the trees go but with property that big it is nice to make room for the new growth! thanks for guest posting today!!! Hope you are having a great day!! I can only imagine how sad it made you to have to cut the trees. Maybe when its done you can plant some more trees, does your state have a program for that? Some I believe do and will actually give you seedlings each year. I believe that thinning is a good thing. Living in the very dry west I am an advocate of thinning to prevent wildfires. As long as you are not clear cutting then you really have no reason to feel guilty. Besides, the money is going to be a good thing! To log or not to log--it's a tough call. The propaganda encouraging a person to log is pretty powerful and convincing, and seems to make sense if one lives in an area with wildfires. But if it's wet where you live, I also find logging a disagreeable choice! Wow. 72 Acres. That sounds wonderful. And your heart is in the right place...only good can come from that. I can understand why you'd feel that way. Your writing brought me right there with you as you heard those trees coming down. I love your compassion about nature and wildlife. 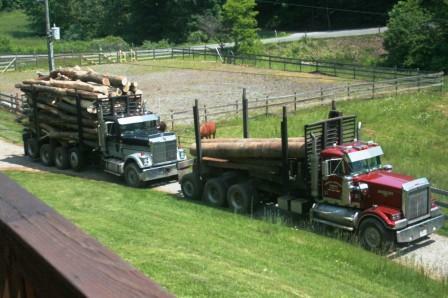 I can tell this must be a dire situation or you and your family wouldn't think about logging. Love this post Lisa. I'm sorry you feel so bad about this, but if it is only the older trees, maybe it will help, and you gotta do what you've gotta do. There are still plenty of other trees around, so the animals will move, they are so much more adaptable than we are. We bought our house 30 years ago, one reason was the huge beautiful maple in the front yard that was so gorgeous in all seasons. And it got sick a few years ago and we had to cut it down. My heart broke. I felt a part of me and even my youth going with it. I did discover that now lots more light comes in the window, but still. Awww it makes me kinda sad to lose those trees too but I LOVE that you found a way to give back by recycling. off to check out your guest post! I have felt this way about trees for a long time. I would do the same as yall are doing though, we have to do what we have to do. Recycling is a good thing for you to do! Oh, this is so sad. But new trees will grow in their place, and it will all be okay! Oh I can see the sadness and necessity of it. I suppose life is full of such moments! The linky will be up in the morning! It can be sad, but it does make room for new, thriving, growth. My husband always says Take care of the land and it will take care of you. Must have been such a hard decision. I would have felt sad as well :( Those little animals will just have to move over to the next tree :) Maybe they'll like the view even more?! I'm sorry, mama. I don't know the half of what that must be like for you but I am sure it was tough. Thinking of you and hoping you feel better today! You're doing the right thing... our last property was 96 acres and densely wooded besides the few fields. We did a minor foresting and you would be amazed at how the surrounding trees flourished, much healthier in the following year! Also, wildflowers grew in the open areas and wildlife, like deer and foxes and the birds in particular, loved the new space... still wooded, just a little less dense, letting the sun in. It's the right thing to do. Stopping by from PYHO. Honestly it sounds like you are doing a lot! I know how hard it must have been to cut down those trees, but doing sometimes the hardest choices aren't always the easiest. you are doing more than most. I live in an area where there are controlled burns to clear underbrush. The idea is to prevent wildfires, still it's heartbreaking to see the charred trees. You're doing what is best for your family, while still respecting nature, this is a good thing. I love your heart for the environment. I'm sorry you're feeling guilty. You have to do what you have to do, though! Thanks for posting this! I stopped by from PYHO. This is great information because we are planning to move to Colorado in a few years and this is something that I may have to do. It's good to know other ways that I can give back, environmentally speaking. I think you have a perfect balance between the two and that is a perfect place to be, albeit, a hard one. Awww, I can see how heartbreaking it is about the trees. Where I grew up the main road to my parents house used to dead end. About ten years ago they bulldozed and opened the road through to another main road. I was sad, but they left all the trees on both sides. It was still undeveloped, until a year ago. Developers have started ripping all those trees out to build yet another strip mall with a movie theater. It makes me sooo sad. I have seen many bobcats, deer, raccoons and other wild animals out there. Now where will they go? I too, have been trying harder to help the planet. I'm using more eco friendly products, I recycle and have started a compost container. Every little bit helps from us all. As a family business owner of a lumberyard, we thank you. Logging in the USA is sustainable. There hasn't been clear cutting in over 60 years in the US. Ease your guilt and know you are supporting our business. We'll sell that wood for a becoming economy on the North Dakota prairie. I dunno...harvesting trees as compared to slashing everything, seems pretty responsible. Old trees die and are wasted so why not harvest them and make a few bucks to boot?